The TJ4200 TopJet Ceiling Air Inlet revolutionized the hog industry and rendered the old style C2000 Inlet obsolete for hog producers who valued improved product performance in their hog barn facilities. Tests have shown the primary cause of illnesses in hog barns is linked to poor air quality. The TJ4200 produces better air quality, improves air temperature consistency, reduces heating expense, lowers production costs, and produces healthier animals. 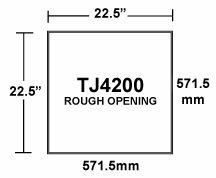 The TJ4200 TopJet Ceiling Inlet is engineered to allow more CFM through inlet than a C2000 inlet and operates at higher static pressure for better air mixing. Unlike traditional inlets, the TJ4200 louvers direct airflow along the ceiling for better air mixing. An all season, four directional hog inlet, the TJ42oo features louvers that open from the TOP instead of the bottom. This directs air along the ceiling and holds the air up longer while mixing with room air and distributing it even more evenly throughout the animal room. The patented design of the TJ4200 4-Way Ceiling Air Inlet significantly increased the speed and distance air travels across the ceiling. The TJ4200 Ceiling Inlets are engineered to allow the flexibility of operating rooms at a higher static pressure, which moves outside fresh air at a greater distance and holds air up to the ceiling longer. The amount of warm air the fresh air mixes with is significantly increased before settling to the animal level. Thus, the room temperature is kept much more consistent throughout the room, reducing drafting and chilling effects on pigs. One very important way to save fuel is to have good mixing of air so as to prevent temperature stratification, with warm air staying near the ceiling and cold air collecting at animal level. By bringing in the air at a higher speed at ceiling level, you get better mixing with minimal air movement at the animal level, achieving great air quality with less drafting or chilling of the animals. Proper ventilation technique and air inlet management are very important in promoting good air mixing in cold weather. If ventilation is not managed properly, it can make the problem worse. Air needs to be made uniformly warm in order to prevent stratification. Mixing or stirring up the air in the swine unit produces less of a temperature difference from ceiling to floor and more uniformity from wall to wall. The revolutionary, patented design of the TJ4200 with maximized Jet Technology provides a better mixing of fresh intake air within the hog room and distributes air evenly from one TJ4200 Inlet to another, gently mixing air without creating a draft for your pigs. Four directional louvers direct air along the ceiling and hold the air up longer while mixing with room air and distributing it evenly. Creates less draft and chilling for better air mixing. Snap-together design allows for minimal work site waste. The Fast Frame consists of a plastic outside frame with a wooden inside frame that provides a clean, professional installation with no exposed lumber. This frame accommodates the TJ4200, C2200, AC3010, and GC1140 inlets. Overall Dimensions: 32" x 32"